If the beam diameter of the incoming laser beam is toobig or the scan angle is above the maximum allowedangle, parts of the laser beam might hit mechanical partswhen passing through the objective. This is referred to asclipping of the laser beam. A laser beam being clipped inside the objective will generateunwanted stray light and might also heat up theobjective leading to thermal focus shift and even destructionof the lens. All JENar Standard and Silverline lensesare designed to show no beam clipping when used withthe scanner setup described on the datasheets. Whereas the focal length is a rather theoretical construct,the back working distance describes the real distancebetween the end of the objective (the edge closest to theworkpiece) and the workpiece. The back working distance describes how much freespace there is between workpiece and lens. 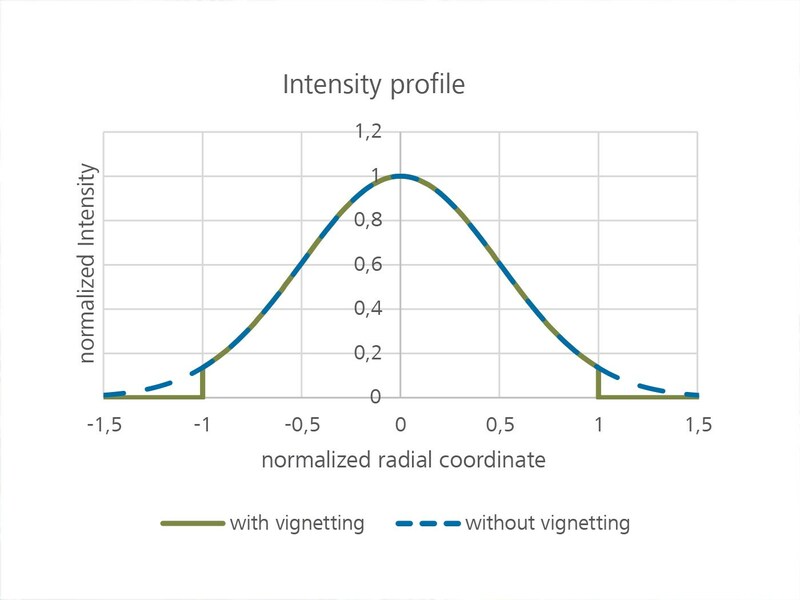 Sincefocal length and back working distance are closelyrelated, the need for a bigger free space between workpieceand objective usually results in the requirement ofusing lenses with bigger focal lengths. P_0 is the input power of the laser. 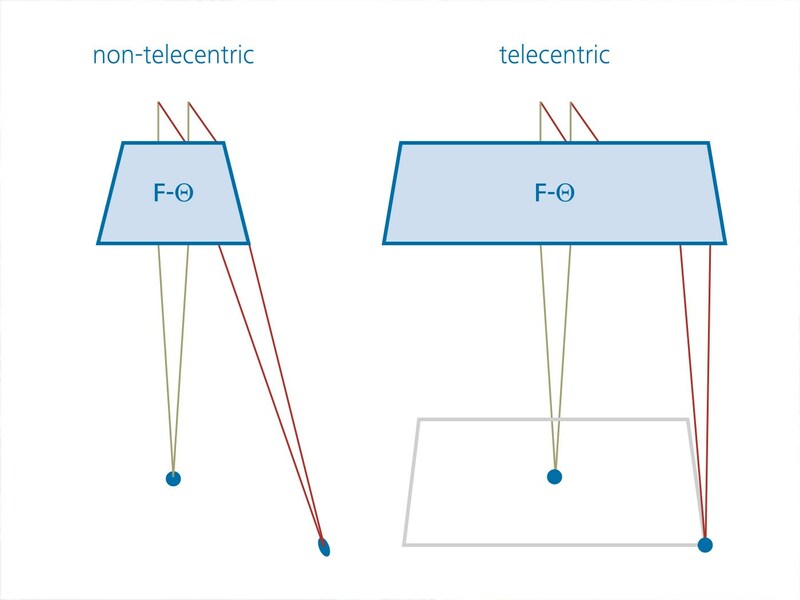 f is the focal length of the lens. The sum is then over all optical elements in the system, indicated by the index i. n_i and dn/dT_i describe the index of refraction and its thermal derivative. alpha_i is the thermal expansion coefficient, lambda_i is the heat conduction coefficient, A_i and B_i describe the absorption coefficients of coating and material respectively. d_i is the thickness of the element, and phi_i is the diameter of the laser beam on element i. For high power applications, the range of usable/affordable materials is small (fused silica or CaF2) which fixes most of the material coefficients (dn/dT, n, alpha, lambda). 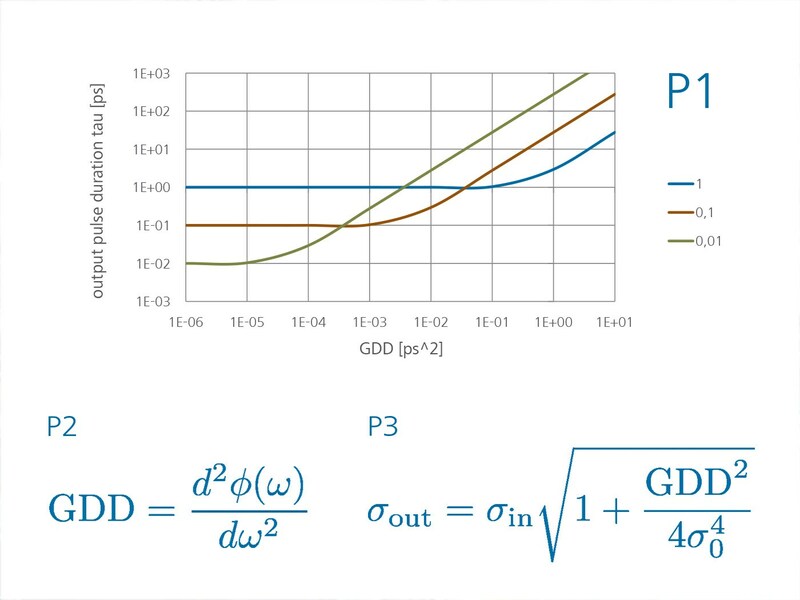 Furthermore, the application requirements determine the parameters input power (P_0) and focal length (f) and the beam sizes (phi) on and thickness (d) of the elements in an F-Theta lens usually constitute no powerful optimization parameters. I.e. optical designs which fulfill the optical specification usually do not differ very much in their respective lens shapes. Therefore, the most promising strategy to reduce the thermal focus shift of a system is to reduce the amount of energy being absorbed. This can be achieved by choosing low absorbing materials and coatings. A thermal focus shift, when uncompensated, changesthe application performance over time. A workpiece being in perfect focus at the beginning of the process might be considerably out of focus after some process time and the application result will look very different. Fused silica exhibits extremely small material absorption and is therefore very well suited for being used for high power applications. 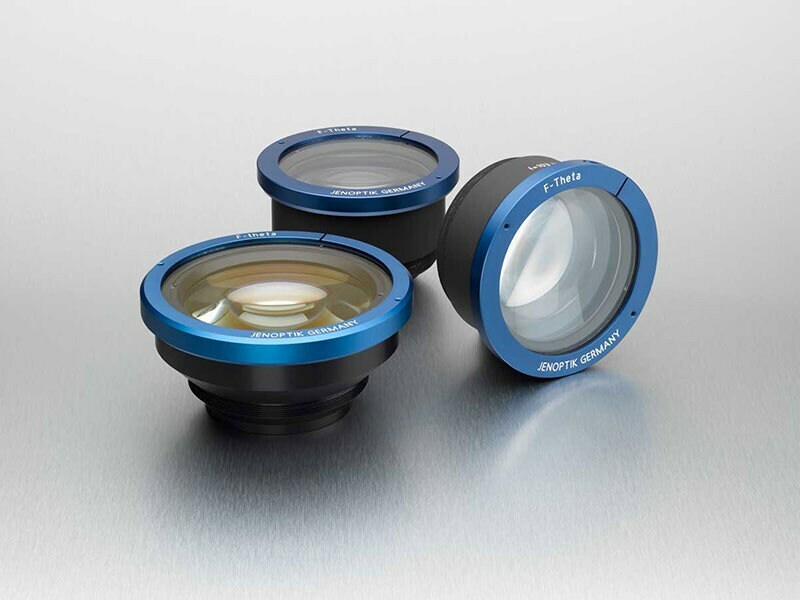 For their NIR (1064 nm) Silverline™ F-Theta lenses, Jenoptik chooses low-absorbing fused silica material and an optimized lowest-absorbing high performance coating. The maximum absorption of 5 ppm of the coating is guaranteed by a standardized absorption measurement procedure for every coating batch. The manufacturing statistics is shown in the following graph. The laser induced damage threshold (LIDT) describes the laser intensity (or fluence) above which damage of the lenses occurs. This threshold depends on several parameters like wavelength and pulse duration and involves different physical phenomena. For CW and long pulses (bigger than 10 ns) the main problem is the accumulation of energy inside the material and subsequent melting and evaporation. For ultra-short pulses (smaller than 10 ps), on the other hand, non-thermal processes like avalanche ionization and coulomb explosion are dominant reasons for damage.This variety of different processes makes an analytical description very difficult and for industrial purposes it seems to be advisable to test coatings and materials and derive phenomenological descriptions. 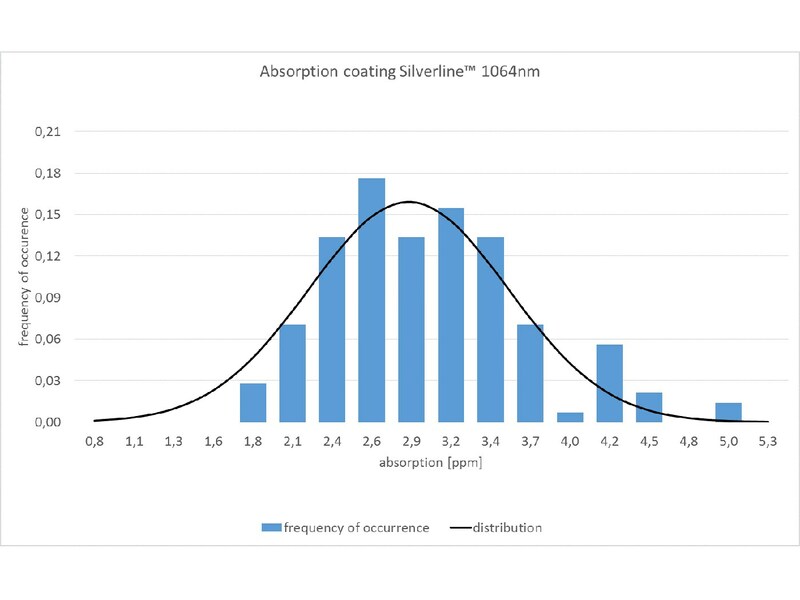 Jenoptik tested its standard coatings and materials for the most common application parameters and expressed the pulse-duration dependent damage threshold fluence Φ in terms of a power law of the pulse duration τ. The parameters c and p of this law are wave length dependent. 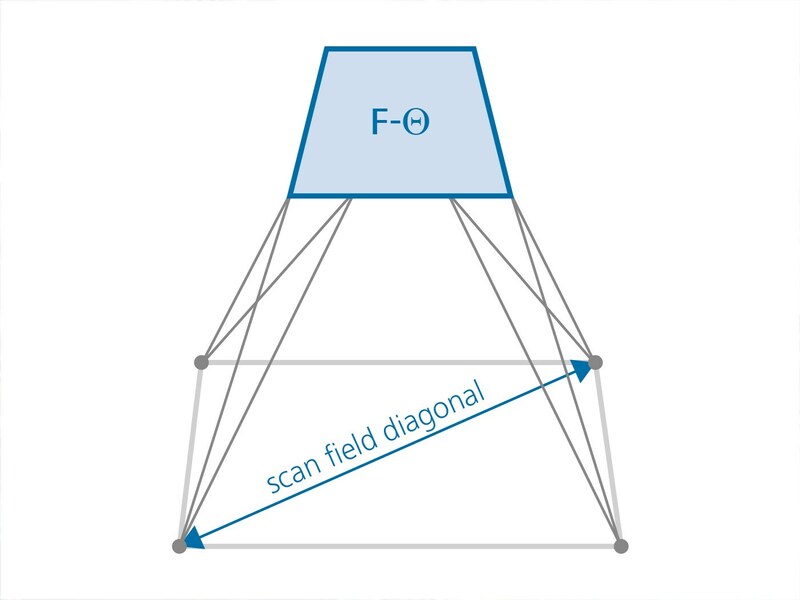 Being able to pass more energy per time through anoptical system allows a faster scanning and therefore a higher throughput.